The lovely brick building in which Grandstreet Theatre resides was built in 1901 as the Unitarian Church of Helena. In 1903, the Rev. Hodgin was hired as pastor for the church and settled in Helena with his young wife, Clara. A former kindergarten teacher, secretary and instructor at institutes in Iowa, Clara promptly endeared herself to its youngsters; her Sunday school soon brimmed with more than 100 students. Unitarians believed that their spaces should also perform civic functions and that the church should be the focal point of community interaction and expression – not only religious, but artistic and educational. Unitarianism is an “open-minded approach to faith” that encourages individual freedom, equality for all and thought based on reason. In what can only be described as spookily prescient, one of Clara’s favorite projects involved directing her small students in pageants and plays in the sanctuary’s auditorium. When Clara died of illness in 1905, she left boxes of ideas on note cards and hundreds of files of future projects. After Clara died at age 34, members of the congregation commissioned a stained-glass Tiffany window in her memory. Louis Comfort Tiffany was an accomplished New York City decorative artist who lived from 1848 to 1933. In 1933 when the building was gifted to the city of Helena for a library, the window was removed and packed up. In 1976, the library was moved and the Grandstreet Theatre company took up residence in the old church. Around this time – another eerie coincidence – someone discovered the window crated up in the Civic Center’s basement, and it was restored and reinstalled in the theater. Within days, staff members started seeing and hearing strange things. Odd creaking noises. Quiet whispers. Movements in the distance. Sounds of footsteps in empty corridors. Lights switched on and off, and doors swung open and slammed seemingly by themselves. Even more inexplicable was that an unusual radiance seemed to outline where the stained- glass window dangled. Baumler said that she has had her own special encounter with the famous phantom of Grandstreet. It happened at a benefit last Halloween while Baumler was on the stage at Grandstreet sharing stories from her book of haunted tales. Many people think that Clara’s spirit watches over the children who participate in activities at the theater. Some have reported seeing a “misty kind of thing” suspended in the balcony. 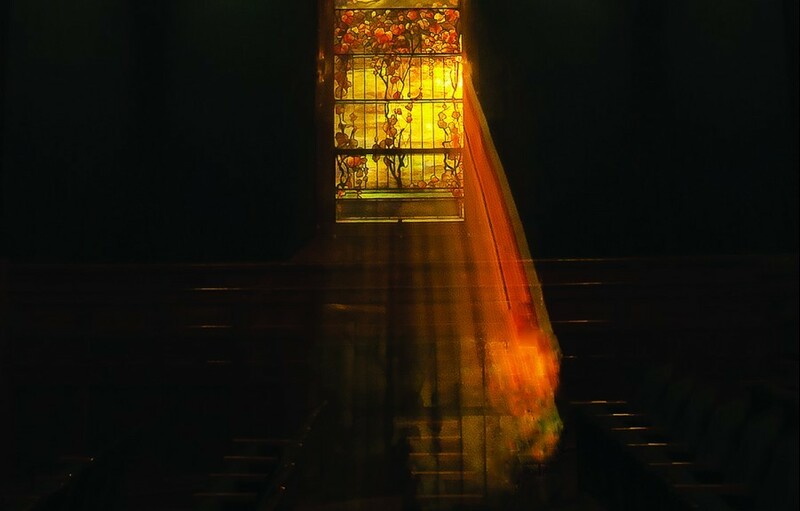 Others have had more unnerving experiences, like the frightened drama teacher who claimed he was sitting near the stain glass window and spotted a sitting figure of a woman. Baumler said that paranormal investigators have visited the building on several occasions but have yet to find “valid proof” of such psychic or telepathic behavior. One longstanding employee said that she had yet to experience any such dealings with Clara or any other lingering spirits.